Turkish President Recep Tayyip Erdogan on Friday inaugurated Yavuz Sultan Selim Bridge – the third bridge to link Europe and Asia across the Bosphorus. 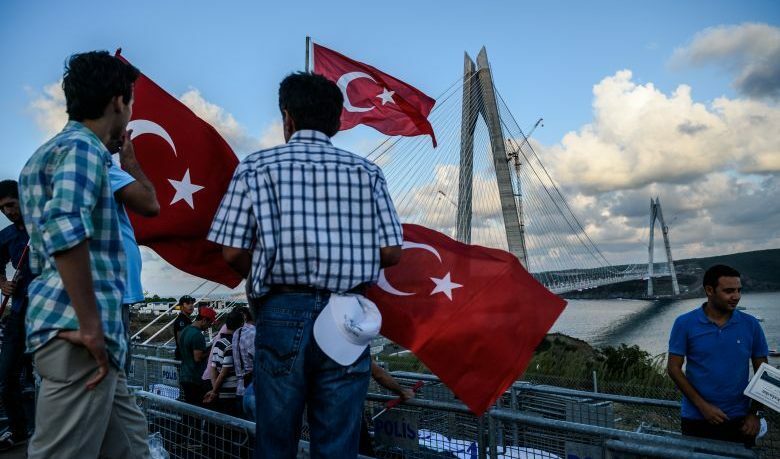 Turkish President Recep Tayyip Erdogan on Friday cut the ribbon opening the Yavuz Sultan Selim Bridge – the third bridge to span the Bosphorus and link both sides of Istanbul as well as the continents of Europe and Asia. The opening ceremony was attended by Bulgarian Prime Minister Boyko Borisov, Macedonian President Gjorge Ivanov, King Hamad bin Isa al-Khalifa of Bahrain, and President of the Turkish Republic of Northern Cyprus Mustafa Akinci. Senior officials from Pakistan, Georgia and Serbia also attended the ceremony. The bridge – which began being built in May 2013 and was completed at a cost of $3 billion – has been constructed with the intention of providing traffic, particularly freight, with a way to bypass the busy motorways of inner Istanbul and the two pre-existing bridges. It has a total of eight lanes for cars as well as two railway lines. In order to accommodate these it is 58.5 metres wide – wider than any other suspension bridge in the world. The bridge will also help provide easier access to Istanbul’s new third airport when that project is completed. The Turkish Government hopes the bridge will ultimately help tackle air pollution and save around $1.45 billion in energy costs and $335 million in labour costs. It has guaranteed operators that 135,000 cars will use the bridge each day. The bridge is unusual not only in its record-setting width, but also in that parts of it are cable-stayed – meaning they are supported by cables connected directly to its two pylons – while the main span of the bridge differs in following a suspension design. In addition, the bridge’s pylons are themselves exceptional in terms of height. The longer of the two pylons is 322 metres tall – only two metres shorter than the Eiffel tower. Its immediate predecessor, Fatih Sultan Mehmet Bridge, was built in 1988 and named after the conqueror of Constantinople. Similarly, Yavuz Sultan Selim Bridge is also named after a famous sultan of the Ottoman Empire. Sultan Selim “The Stern” led the empire to greatly expand throughout the Middle East and Arabian Peninsula, culminating in the conquest of the Muslim holy cities of Mecca and Medina. This allowed him and his descendants to be declared caliphs of Islam.